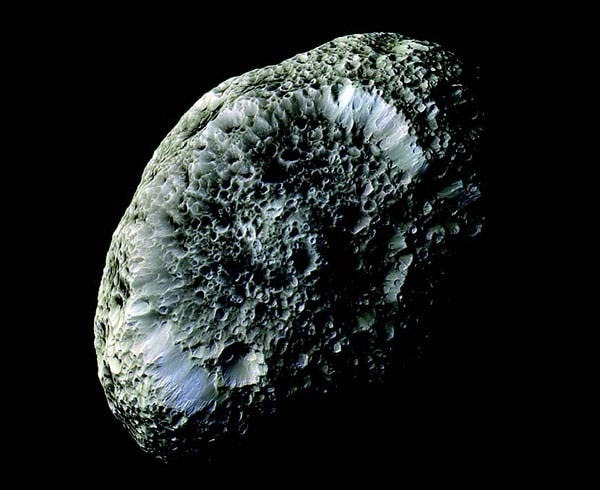 Saturn's weird moon, Hyperion, measures about 255 x 163 x 137 miles in diameter along its three axes. Because moons of this size usually have enough gravity to pull them into a spherical shape, astronomers suggest that it may be a fragment of a larger moon that was shattered by an impact. The planet's odd shape prevents rotational locking, because the gravitational torques from Saturn and it's largest moon, Titan, tug at it unevenly. This results in a rotation that's impossible to predict. with The days that are never the same and Hyperion's north pole continually points to a different location in space. Astronomers know the equation to predict the moon's rotational motion, but small uncertainties in measurements of the moon's initial location or velocity turn into large uncertainties over time.